Leonardo studied the painting and was not satisfied with the direction it was going. 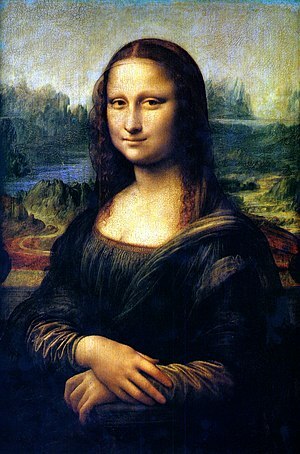 He’d spent hours brushing it up but Leonardo wasn’t convinced, when the Lady La Gioconda sat down for the portrait, it was easy but now, putting finishing touches to it seemed like a herculean task. In anger, he yanked it off and took it to his sparsely furnished room and hid it under the bed. Straightening up, he sauntered outside his room, staring mournfully at his tools, he felt no inspiration, nothing. His mind was dead, his brains passive, his emotions bland and then out of the blues, he saw a rat. His brown eyes followed the rat everywhere, the more he scrutinised it, the more he felt the fluttering of visions and hope surge in his heart. He hurried back to his room, gently drag the painting from under its hiding place and resumed work. His flurried hands began the arduous task of creating the masterpiece that would be one of the most important paintings of all time. With his hand under his chin, he surveyed his handiwork and was quiet satisfied at the result. I was Lisa del Gioconda née Gherardini now a writer living in London. Have you ever felt that lingering sensation that you’ve lived before, in eras long gone? I am a writer so it is very easy for me to transport myself to 1479 when I was born to 1542 when I died. So if I was the Lady La Gioconda, what did I do except pose for a painting which is now one of the most famous paintings of all time? I wish she did more than just sit down for a portrait commissioned by her husband, maybe supported a just cause, a charity, gave to the poor? So, here is the deal… How would you loved or want to be remembered? Let’s say in the next five hundred years, what would people say or write about you? Just give it a thought guys because I am dying to know! This entry was posted in Arts And Paintings and tagged Isleworth Mona Lisa, Leonardo, Leonardo da Vinci, Lisa, London, Mona Lisa, Musée du Louvre, Painting. How difficult? What do you think would be your legacy? At the moment just haven’t got any ideas! Will need time on that! Ok… I’ll wait it out! She just lived. That’s what I’ll do. Let the historians write history. You’re right, Leonardo da Vinci probably wouldn’t realise how famous that painting would be not to talk of Lady La Gioconda. Good comment, thanks! Your comment was rather poetic in nature, hence my ”wow” I love it though. …he loved you, that is, too! I love thinking about what the original was like – that little smirk reveals some hidden personality to be sure! I hope I am remembered for seeking my Saviour, for being real, for making my corner of the world a better place. What about you? That is so beautiful, I love that and mine is not far from yours. I would want to be remembered for making a difference in people’s lives, being a friend to the friendless, giving my all to my fellow man and hopefully, people would be able to say of me when I am gone that, ”she was a christian, she knew christ truly.” I guess that sums it up for me. If I live on in my children’s minds, as my father lives on in mine, then that’s all I need. If anything I do lasts beyond that, it will be a bonus. Thanks for reading and liking my own blog, by the way, Seyi, I really appreciate it. Of course, if you read ‘The Future Me is Real’ you’ll know that science says (sort of!) there’s a way I might come back anyway then I could check out my lingering fame for myself! Thanks Tony, for checking my blog and leaving such a beautiful comment. It would be nice if you could come back and see for yourself, only God knows what the world would look like then. Love your blog too and truly appreciate your comment. Thomas Jefferson designed his tombstone inscription, wanting to be remembered most for writing Declaration of Independence , Virginias’ Statutes of religious freedom and founding Univ. of VA. As for me I trust in God, strive to do my best, and say to all; remember me as you will. That is striking, I think I kind of liked that. Thanks for stopping by, really appreciate it. I never want to be remembered, just like the flower that blossoms in the day, is loved by the butterfly, and quietly wither away before the first light in the next morning. I have to focus to give my best to love and not the best to be remembered. Thank you so much Ganesh, I am blessed to have such faithful readers and followers, God bless you indeed! An excellent and engaging question to fire up the brain cells, which compliments your excellent piece of writing, which has now altered my perception of the Mona Lisa .Another little gem to sit in the crown of your own legacy. I’d like to be remembered as someone who encourages creativity, who helps/supports artists, musicians & writers and to gain recognition for my own writing, which I subsequently hope will inspire future generations of writers. Thank you for your kind comment! I love how you’ll want to be remembered, gaining recognition on your writing is easy because you’re a great writer and history don’t lie. I’ll be re-releasing my novel, ‘The Feet Of Darkness’ soon and I’ll need the support of great friends and writer like you! I’ll keep you posted and thanks for stopping by my website dear friend! How nice of you to say all this Seyi, you have my undying support and devotion – I very much look forward to reading your novel when it has been re-released. Have a great day and chat to you again soon. Thank you David, chat with you soon!